Local agencies know the costs of capital preventive maintenance (CPM) treatments; they are aware of the cost per lane mile (kilometer) for the treatment options. However, a treatment’s value in terms of the extended service life (ESL) that it provides to a specific section of road is seldom known beyond theoretical studies. If it is possible to determine a pavement’s ESL as a result of a treatment, then agencies can gauge cost effectiveness of treatments in terms of a pavement’s service life. With Roadsoft’s new Extended Service Life Calculator, accurate ESL analyses are possible for CPM treatments. When ESL analyses are based on local treatment data, agencies can set data-driven policies for applying specific treatments and can quantitatively measure how treatments might perform in particular locations. This type of cost-effectiveness data can also be used to convince elected officials and the general public that certain CPM treatments are the most efficient means of maintaining road networks. Roadsoft’s Extended Service Life Calculator can generate deterioration curves for particular treatment types applied to specific road segments (see figure below). After pavement is constructed, it deteriorates over time (this is represented by the underlying pavement deterioration curve) until it reaches its critical distress point (CDP). A pavement’s CDP is the time when the pavement condition reaches the PASER 4 line, or the time when pavement deterioration changes from exhibiting age-related to structural distresses. 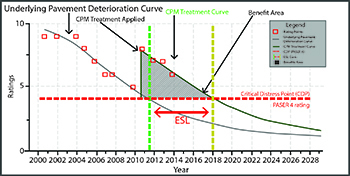 When a CPM treatment is applied to that pavement, the asphalt pavement—as evaluated by the road surface quality—will also deteriorate over time until it reaches its CDP (this is represented by the CPM treatment curve). Thus, the “ESL gain” is the time in years before the pavement reaches its CDP that is gained by the application of a treatment. The ESL benefit directly affects the cost of roadway maintenance since it creates a tangible extension in pavement life. The benefit gained by a treatment can be measured, using deterioration curves, in one of two ways. The first method defines benefit as the improvement in pavement condition over time as a result of the treatment. While this method of measuring benefit acknowledges improvements to the roadway (smoother ride, less visible distresses, etc. ), these may not result in longer pavement life. The drawback to this first method is how difficult it is to relate the benefit of a generally-increased pavement condition over time to a dollar value for road agencies or the motoring public. The second method measures benefit by the ESL that results from a specific CPM treatment; it also evaluates the time before a pavement needs expensive treatments such as rehabilitation or reconstruction. Therefore, ESL is measured as the additional time in years that the pavement is above the CDP due to treatment. Roadsoft's ESL modelling capabilities have been tested on two occasions--in a 2014 study and a 2018 study. In both studies, road data requested from 600 Michigan road-owning agencies was filtered through three different tiers of criteria selection, ultimately receiving eligible data on chip seal, chip seal plus fog seal, thin overlay, crush and shape, thick overlay, microsurface, and cape seal. eligible chip seal treatments went from 558 miles (898 kilometers) and statewide average ESL gain of 4.1 year in 2014 to 785 miles (1,263 kilometers) and statewide average ESL gain of 4.1 years in 2018.
chip seal and fog seal with 20.7 miles (33.3 kilometers), microsurface with 8 milles (13 kilometers), and cape seal with 11 miles (18 kilometers) comprised data sets that were insufficient to make conclusions. qualifying chip seal and fog seal combination treatments covered 196 miles (315 kilometers) and had a statewide average ESL gain of 7.1 years. qualifying thin overlay treatments covered 162 miles (kilometers) and had a statewide average ESL gain of 6.9 years. qualifying crush and shape treatments were applied to 143 miles (kilometers) and had a statewide average ESL gain of 11.3 years. qualifying thick overlay treatments were applied to 302 miles (kilometers) and had a statewide average ESL gain of 9.1 years. micosurface treatments with 27 miles (43 kilometers) cape seal treatments with 35 miles (56 kilometers), as well as slurry seal, cold-in-place plus overlay, hot-in-place, hot-in-place plus overlay, hot-mix asphalt wedge plus chip seal, hot-mix asphalt wedge plus overlay, and reconstruction treatments comprised data sets that were insufficient to make conclusions. In their discussion of the results, the researchers stated that, because of the conservative nature of the study and their strict selection criteria, these results should be considered the minimum ESL gain for these treatment methods. The most-recent report, 2018 Michigan Local Agency Pavement Treatment Life Study, is accessible from the CTT's Asset Management Resources page.